Systems science is an interdisciplinary field that studies the nature of systems—from simple to complex—in nature, society, cognition, engineering, technology and science itself. To systems scientists, the world can be understood as a system of systems. The field aims to develop interdisciplinary foundations that are applicable in a variety of areas, such as psychology, biology, medicine, communication, business management, engineering, and social sciences. Systems science covers formal sciences such as complex systems, cybernetics, dynamical systems theory, information theory, linguistics or systems theory. It has applications in the field of the natural and social sciences and engineering, such as control theory, operations research, social systems theory, systems biology, system dynamics, human factors, systems ecology, systems engineering and systems psychology. Themes commonly stressed in system science are (a) holistic view, (b) interaction between a system and its embedding environment, and (c) complex (often subtle) trajectories of dynamic behavior that sometimes are stable (and thus reinforcing), while at various 'boundary conditions' can become wildly unstable (and thus destructive). Concerns about Earth-scale biosphere/geosphere dynamics is an example of the nature of problems to which systems science seeks to contribute meaningful insights. Since the emergence of general systems research in the 1950s, systems thinking and systems science have developed into many theoretical frameworks. Systems analysis is the branch of systems science that analyzes systems, the interactions within those systems, and/or interaction with its environment, often prior to their automation as computer models. This field is closely related to operations research. Systems design is the process of "establishing and specifying the optimum system component configuration for achieving specific goal or objective." For example in computing, systems design can define the hardware and systems architecture which includes many sub-architectures including software architecture, components, modules, interfaces, and data, as well as security, information, and others, for a computer system to satisfy specified requirements. System dynamics is an approach to understanding the behavior of complex systems over time. It offers "simulation technique for modeling business and social systems," which deals with internal feedback loops and time delays that affect the behavior of the entire system. What makes using system dynamics different from other approaches to studying complex systems is the use of feedback loops and stocks and flows. Systems engineering (SE) is an interdisciplinary field of engineering, that focuses on the development and organization of complex systems. It is the "art and science of creating whole solutions to complex problems," for example: signal processing systems, control systems and communication system, or other forms of high-level modelling and design in specific fields of engineering. Soft systems methodology (SSM) : in the field of organizational studies is an approach to organisational process modelling, and it can be used both for general problem solving and in the management of change. It was developed in England by academics at the University of Lancaster Systems Department through a ten-year Action Research programme. System development methodology (SDM) in the field of IT development is a variety of structured, organized processes for developing information technology and embedded software systems. Viable systems approach (vSa) is a methodology useful for the understanding and governance of complex phenomena; it has been successfully proposed in the field of management, decision making, marketing and service. Systems theory is an interdisciplinary field that studies complex systems in nature, society, and science. More specifically, it is a conceptual framework by which one can analyze and/or describe any group of objects that work in concert to produce some result. Systems sciences are scientific disciplines partly based on systems thinking such as chaos theory, complex systems, control theory, cybernetics, sociotechnical systems theory, systems biology, systems chemistry, systems ecology, systems psychology and the already mentioned systems dynamics, systems engineering, and systems theory. Systems sciences cover formal sciences like dynamical systems theory and applications in the natural and social sciences and engineering, such as social systems theory and system dynamics. General systems scientists can be divided into different generations. The founders of the systems movement like Ludwig von Bertalanffy, Kenneth Boulding, Ralph Gerard, James Grier Miller, George J. Klir, and Anatol Rapoport were all born between 1900 and 1920. They all came from different natural and social science disciplines and joined forces in the 1950s to establish the general systems theory paradigm. Along with the organization of their efforts a first generation of systems scientists rose. Among them were other scientists like Ackoff, Ashby, Margaret Mead and Churchman, who popularized the systems concept in the 1950s and 1960s. These scientists inspired and educated a second generation with more notable scientists like Ervin Laszlo (1932) and Fritjof Capra (1939), who wrote about systems theory in the 1970s and 1980s. Others got acquainted and started studying these works in the 1980s and started writing about it since the 1990s. Debora Hammond can be seen as a typical representative of these third generation of general systems scientists. The International Society for the Systems Sciences (ISSS) is an organisation for interdisciplinary collaboration and synthesis of systems sciences. The ISSS is unique among systems-oriented institutions in terms of the breadth of its scope, bringing together scholars and practitioners from academic, business, government, and non-profit organizations. Based on fifty years of tremendous interdisciplinary research from the scientific study of complex systems to interactive approaches in management and community development. This society was initially conceived in 1954 at the Stanford Center for Advanced Study in the Behavioral Sciences by Ludwig von Bertalanffy, Kenneth Boulding, Ralph Gerard, and Anatol Rapoport. In the field of systems science the International Federation for Systems Research (IFSR) is an international federation for global and local societies in the field of systems science. This federation is a non-profit, scientific and educational agency founded in 1981, and constituted of some thirty member organizations from various countries. The overall purpose of this Federation is to advance cybernetic and systems research and systems applications and to serve the international systems community. The best known research institute in the field is the Santa Fe Institute (SFI) located in Santa Fe, New Mexico, United States, dedicated to the study of complex systems. This institute was founded in 1984 by George Cowan, David Pines, Stirling Colgate, Murray Gell-Mann, Nick Metropolis, Herb Anderson, Peter A. Carruthers, and Richard Slansky. All but Pines and Gell-Mann were scientists with Los Alamos National Laboratory. SFI's original mission was to disseminate the notion of a separate interdisciplinary research area, complexity theory referred to at SFI as complexity science. Recently, IIT Jodhpur in Rajasthan, India started inculcating system science and engineering to its students through Bachelors, Masters and Doctorate programs. This makes it the first institution to offer system science education to students in India. ^ G. E. Mobus & M. C. Kalton, Principles of Systems Science, 2015, New York:Springer. ^ Philip M'Pherson (1974, p. 229); as cited by: Hieronymi, A. (2013), Understanding Systems Science: A Visual and Integrative Approach. Syst. Res.. doi:10.1002/sres.2215. He defined systems science as "the ordered arrangement of knowledge acquired from the study of systems in the observable world, together with the application of this knowledge to the design of man-made systems." ^ According to Francis Heylighen in "What are Cybernetics and Systems Science?" on Principia Cybernetica Web (1999) systems science is an "academic domain, that touches virtually all traditional disciplines, from mathematics, technology and biology to philosophy and the social sciences." B. A. Bayraktar, Education in Systems Science, 1979, 369 pp. Robert L. Flood, Ewart R Carson, Dealing with Complexity: An Introduction to the Theory and Application of Systems Science (2nd Edition), 1993. George J. Klir, Facets of Systems Science (2nd Edition), Kluwer Academic/Plenum Publishers, 2001. Jiri Kroc, Karel Balihar, Martin Matejovic, Complex Systems and Their Use in Medicine: Concepts, Methods and Bio-Medical Applications, ResearchGate, doi:10.13140/RG.2.2.29919.30887, 2019. Ervin László, Systems Science and World Order: Selected Studies, 1983. G. E. Mobus & M. C. Kalton, Principles of Systems Science, 2015, New York:Springer. Anatol Rapoport (ed. ), General Systems: Yearbook of the Society for the Advancement of General Systems Theory, Society for General Systems Research, Vol 1., 1956. Li D. Xu, "The contributions of Systems Science to Information Systems Research", Systems Research and Behavioral Science, 17, 2000, pp. 105–116. Graeme Donald Snooks, "A general theory of complex living systems: Exploring the demand side of dynamics", Complexity, vol. 13, no. 6, July/August 2008. 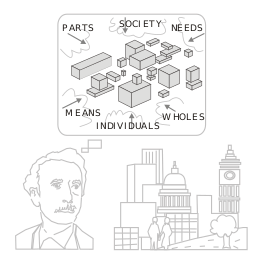 Wikimedia Commons has media related to systems theory.